Share your form with QR Code and post it anywhere. We also offer you sharing a form with QR Code. QR code is a two dimensional barcode that stores information in black and white dots. 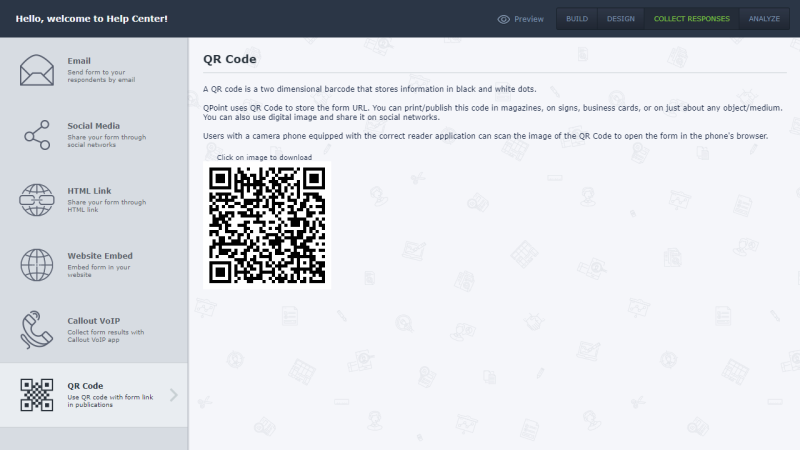 QPoint uses QR Code to store the form URL. The functional ability to use QR Code allows you to share this code in magazines, on signs, business cards, or on just about any object/medium. You can also use digital image and share it on social networks, websites etc. Users with a camera phone equipped with the correct reader application can scan the image of the QR Code to open the form in the phone's browser.